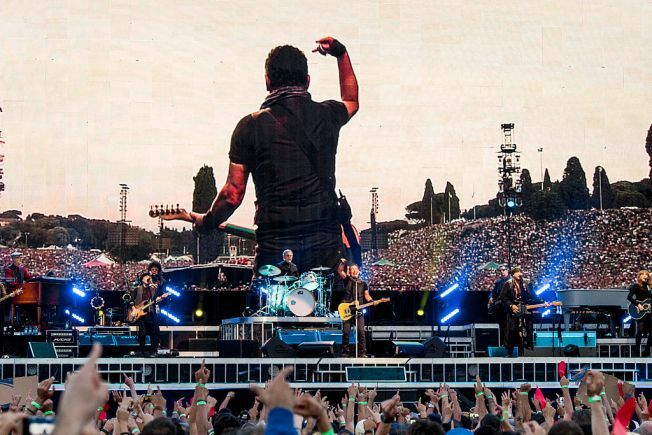 ROME, ITALY - JULY 16: Bruce Springsteen and The E Street Band performs in concert at Circo Massimo on July 16, 2016 in Rome, Italy. A Bruce Springsteen concert scheduled for Saturday in Virginia Beach has been moved to Monday because of weather. Concert officials said the performance scheduled for Saturday at Veterans United Home Loans Amphitheater has been rescheduled because of weather caused by Tropical Storm Hermine. Officials said the concert was rescheduled out of concern for the safety of fans. Officials said ticket holders should hold on to their tickets and use them Monday. They said no exchange is necessary.